Bringing an end to the Israeli occupation of Palestinian land is as much a prerequisite for peace in the Middle East as is the Palestinian recognition of Israel. The Israeli occupation is not only inhuman and the cause of extreme suffering for the 3.5 million Palestinians living under its subjugation, but it is also illegal under international law. Attempts to claim otherwise have no legal validity and are morally bankrupt and politically dangerous since they basically preclude the achievement of peace. While it is true that victorious powers can legally occupy hostile territories seized in the course of conflict – an example of which is the Allies’ occupation of the territory of Nazi Germany during World War II, foreign occupation should nevertheless be a temporary situation, pending a political settlement or solution. During the interim, the occupying Power must comply with relevant instruments of international humanitarian law with regard to its conduct in the territory it has occupied. International law is very clear on two basic principles: the inadmissibility of the acquisition of territory by war and the prohibition of the transfer of civilians of the occupying Power to the occupied territory. Both are intended to prevent expansionism and the colonisation of occupied territories. Both complement another explicit principle of international law, namely the right of peoples to self-determination, a right that a colonial or occupying Power is obliged to respect. The Israeli occupation has clearly violated all three of these principles of international law. In fact, throughout its prolonged occupation, Israel has persistently and aggressively breached international law. Thus, what makes the Israeli occupation of Palestinian land illegal is not the fact that it occurred during the war of 1967 (regardless of the narrative concerning the causes of the war). What makes the Israeli occupation illegal is that it has existed for 35 years, during which time it transformed into a form of colonialism and suppressed and oppressed an entire people for decades, preventing them from the exercise of their right to self-determination and the establishment of their State, Palestine. Israel, as an occupying Power, has undertaken countless measures attempting to change the legal status, demographic composition and character of the territory by confiscating land, exploiting natural resources, building more than 250 settlements, transferring more than 400,000 Israelis to the occupied territories, establishing a dual system of law and even annexing part of the territory. These actions have been carried out in direct contravention of the Fourt Geneva Convention relative to the Protection of Civilian Persons in Time of War, which, among other things, defines the rules of conduct and the obligations of the occupying Power. Clearly then, the active intent of the Israeli occupation has been to negate Palestinian rights, to create new facts on the ground and to illegally expand Israel’s borders. Security Council resolution 242 (1967), which is the bedrock of the peace process and of any future peace settlement, is anchored in the principle of the inadmissibility of the acquisition of territory by war. The old and deceptive argument that the resolution calls for withdrawal from ‘territories’ and not ‘the territories’ not withstanding (in fact, the French text of the resolution does contain the article ‘the’). The call in the resolution for the withdrawal of Israel can only be read within the context of the above-mentioned principle. Since the onset of the Israeli occupation in 1967, and in response to established, illegal policies and practices of the occupying Power, the Security Council has adopted 26 resolutions that affirmed the applicability of the Fourth Geneva Convention to the territories occupied by Israel. Of those resolutions, several deal directly with the issue of Israeli settlements and several also specifically deal with Israeli violations in Occupied East Jerusalem. The resolutions clearly address the illegality of Israel’s policies and practices with regard to both issues. For example, some of the resolutions affirm that the Israeli settlements ‘have no legal validity‘; call upon the government and people of Israel ‘to dismantle the existing settlements’; and call upon ‘all States not to provide Israel with any assistance to be used specifically in connection with settlements in the occupied territories’. As for Occupied East Jerusalem, which the Israeli government illegally annexed in 1980, the Security Council, in resolution 478 (1980), determined ‘that all legislative and administrative measures and actions taken by Israel, the occupying Power, which have altered or purport to alter the character and status of the Holy City of Jerusalem, and, in particular, the recent “basic law” on Jerusalem are null and void and must be rescinded forthwith’. Similar affirmations were made by the Council in several other resolutions. Moreover, the General Assembly and other UN organs have adopted scores of resolutions on the illegal policies and practices of the Israeli occupation and on the legitimacy of, and the necessity for, the exercise of the right to self-determination by the Palestinian people. There has therefore been absolutely no impropriety on the part of the UN Secretary-General concerning his recent statements with regard to the Israeli occupation. Kofi Annan’s call for an end to ‘the illegal occupation’ was not only legally correct but was also not a concept invented by the Secretary-General, as reflected in the numerous resolutions of the United Nations. It was, however, important for Mr Annan to add his moral authority to the urgent need for an end to that illegal occupation, particularly during this late stage in the perilous deterioration of the situation. In that statement on 12 March 2002, the Secretary-General addressed both the Palestinian and Israeli sides. The Palestinian side probably did not like everything it heard. But, taken in its entirety, the statement was widely viewed as a necessary and responsible call that intended to, and should, help the parties to move forward towards a peaceful settlement. For this to happen, the Israeli people and the Israeli government must indeed come to terms, for once and for all, with the illegality of their occupation and the need for its termination. About the writer: Dr Nasser Al-Kidwa is Ambassador and Permanent Observer of Palestine to the United Nations. The above article first appeared in Palestine & the UN (Vol. 7 Issue 8, mid-September 2002). Israeli Channel 10 on Thursday released footage taken by Israeli occupation soldiers of themselves humiliating a bound and blindfolded Palestinian man at a West Bank checkpoint. The footage shows the Palestinian kneeling and repeating humiliating sentences given to him to say by the occupation soldiers, who belong to the Golani infantry brigade. As the detainee repeats the words, the occupation soldiers are heard laughing raucously in the background. Later Thursday, the Israeli army issued a harsh condemnation of the troops’ actions. The occupation army claimed it was unaware of the incident until it received the clip from Channel 10, after which it immediately began an investigation. “With the emergence of all of the details, it will be decided whether to take steps and which [to take]. 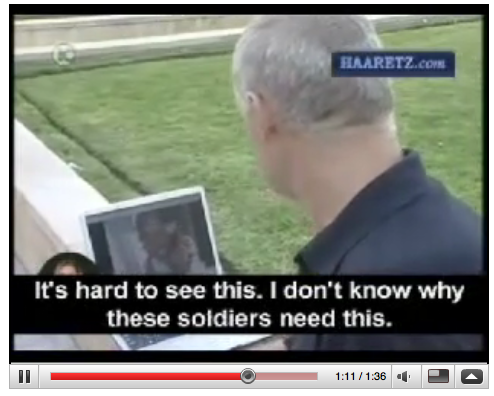 The IDF denunciates this behavior,” the statement said. Bethlehem – Ma’an – Dozens of armored buses brought hundreds of ultra-orthodox Jewish worshippers to pray at Rachel’s Tomb in Bethlehem on Saturday and Sunday evenings. Tour buses lined the streets on the western side of the seperation wall, and roads were blocked off from Tantur to the Beit Jala (Gilo) checkpoint as hundreds of worshipers in black coats and hats gathered in the area. The mass prayer gatherings were organized by the Mosdos Kever Rachel (Rachel’s Tomb Institute) around the date believed to be the anniversary of Rachel’s death. The official date set by the group is 9 November, but worshipers overwhelmed the area on Saturday evening as well. The Institute runs a Jewish religious school at the tomb, and funds a daily bullet-proof bus service that brings Jewish worshippers from Jerusalem to the tomb. In 2003 the group lobbied the Israeli Supreme Court to have the route of the separation wall altered so that the site of Rachel’s Tomb was annexed to the western side of the wall. The petition was successful and the new route of the separation wall cut large swaths out of the Bethlehem municipal lands, ensuring Israelis access to the Tomb. The biblical Rachel is revered as one of the four matriarchs of the Jewish people, and Jewish tradition holds that she was buried by her husband Jacob in Bethlehem. The tomb is also a holy site for Muslims and Christians, and the location of the Bilal Ibn Rabah mosque, which is now inaccessible to West Bank Palestinians. Many of the area’s residents have moved to other parts of Bethlehem since Israel’s construction of the wall, and many buildings in the once vibrant neighborhood at the entrance to Bethlehem now stand empty. Ten meter concrete walls surround Rachel’s Tomb on three sides. The walls are part of the separation wall constructed by Israel after the start of the second Indifadah. There are also sniper towers built into the wall at short intervals. Groups such as the Rachel’s Tomb Institute and the Committee for Rachel’s Tomb, which do not recognize Palestinian claims to the site or the Palestinian Authority (PA) as a legitimate government, aim to establish a permanent, round-the-clock Jewish presence at the site to ensure that it remains under Israeli control in any future Israeli-Palestinian negotiations. The Zionist policy of displacing the Palestinians from Palestine is very much an active policy, but is pursued more forcefully in times of contlict, such as in the 1947-1948 war and in the 1967 war. An appendix entitled “Israel Talks of a New Exodus” is included in this publication to demonstrate past Zionist dispersals of Palestinians from their homeland and to show, besides the main Zionist document we present, other Zionist planning for the de-Palestinization of Palestine. Tzipi Livni and Ehud Olmert have no fundamental disagreements on policies of war, security or peace – issues that might influence the economy, education or social affairs. Furthermore (election rhetoric aside), Livni doesn’t differ significantly on these issues with the Ehud Barak of Shepherdstown and Camp David, or with the Benjamin Netanyahu who went to Wye Plantation and sent Ronald Lauder to Damascus. The idea of the Greater Land of Israel lives on only in the political faction to the right of Likud. The leaders of the national majority, like their voters, have also accepted the idea of parting from Shuafat, Abu Dis and the Golan Heights. The stumbling block that prevents Israel’s departure from the territories is not the demarcation of the final border between us and our neighbors. The only obstacle seen as impassable today on the way to an agreement is the security issue after the territories are vacated. As long as this dilemma has no answer that is convincing to most Israelis, no government, weak or strong, will be able to implement an agreement with our neighbors, even if it dares to sign one. The settlers and other adversaries of compromise and concessions, who were unable to prevent the pullouts from Sinai and the Gaza Strip, will not stand in the way of additional withdrawals either. This, if, as in the case of the evacuation of the Sinai in the early 80s and of Gaza in 2005, public opinion will stand behind the government. In its agreements with Egypt and Jordan, Israel found the answer to the post-withdrawal security issue in the image of Anwar Sadat and King Hussein. We believed not only in their sincerity, but mainly in their ability to keep their promises. Perhaps this situation will recur vis-a-vis Syria. But who on the Palestinian side, even assuming their intentions are good, has the means to ensure, or enforce, security? Unlike the cases of Egypt, Jordan and possibly Syria, the solution with the Palestinians cannot depend on them and Israel alone. Neither of us are capable of pulling it off. The solution could be an international force that would take the place of the Israel Defense Forces in the territories as an integral and binding part of a peace agreement. It need not be a large army, or one similar to the foreign armies we’ve seen in the region since the state’s establishment. Those, including the force in southern Lebanon after the Second Lebanon War, were never more than observers. This would be a combat-ready army, whose mission would be to enforce security. This is not difficult. The West Bank is tiny, not a Vietnam, Afghanistan or Iraq, and is neither marshland nor forest. There is little doubt that most Palestinian people, as well as the government in Ramallah, would accept such an army willingly, if not enthusiastically. The Gaza Strip is a different story, and some arm-twisting would be required, not on the people but certainly on Hamas. Such a force cannot be established without Israel’s agreement. Israel would of course demand as part of that agreement, and would undoubtedly receive, close cooperation with the international force, first and foremost in matters of intelligence and counterterrorism. The foreign force should be here temporarily, its task will include helping to set up an effective Palestinian administration and Palestinian security forces who would eventually serve as a reliable counterterrorist force. All this will ultimately allow for the departure of the foreign army from the West Bank without Israel’s security being endangered. The question is, who will take on this mission? The Americans are the most suitable party. A fraction of their army posted in Iraq could handle the task. But it’s hard to believe that the president of the United States, whoever he will be, would agree to this, due to domestic policy considerations. Perhaps, however, he would agree to help others. The problem is not where to find soldiers for the job. Many would volunteer for it. For example, several East European countries may step up, because of both domestic and prestige considerations. Perhaps Turkey, which is interested in keeping its backyard quiet, could also be taken into consideration.The more important questions are who would define the force’s mission, stand behind it politically, and perhaps even finance it. At this moment the European Union appears to be the only option. The EU, under French and German leadership, could be persuaded to accept the responsibility, but with a few conditions. One, that most of the soldiers are not from its own ranks, especially not from the German army. Also, the initiative must be carried out with American coordination and perhaps even cooperation, and subsequently with NATO’s seal of approval, too. It must also be supported by the Arab League, led by Saudi Arabia, and receive Egypt and Jordan’s active cooperation. Above all, not only must the initiative be supported by the Palestinian government and even more so by Israel, these two must broach it with the Europeans. All four conditions depend to a large extent on Israel. Granted, such an initiative would be revolutionary for Israel. But it’s time the government freed itself from the rigid mindset that a solution can be concocted by us and our neighbors alone, with no foreign participation. The reality is that this attitude has long been obsolete. The writer is director of the Trilateral Center for European Studies at the Interdisciplinary Center, Herzliya, and former Israeli ambassador to the European Union and to Germany. SAFA ABU SEIF, 12, was fatally wounded as she stood in an upstairs room of her home in the Gaza City district of Jabaliya 10 days ago. She was one of 27 children identified by United Nations staff among the 107 Palestinians who were killed in five days last week. Another 25 dead, including five women, were identified as unarmed non-combatants. The status of 13 more dead victims could not be determined. At least three of the children were reportedly shot in their homes by Israeli small arms or sniper fire. A Palestinian gunman killed eight Israeli students on Thursday before he was killed himself. An Israeli soldier was also killed that day. Two Israeli soldiers died in action in the early stages of a three-day incursion into Jabaliya, and an Israeli civilian was killed by Palestinian rocket fire on the first day of the surge in violence. Asked by the Herald to comment on allegations that its troops had killed children in the area, the Israeli Defence Force blamed the violence on terrorist groups who exploited Palestinian civilians as human shields while firing rockets intended to harm Israeli civilians. “IDF operations in the Gaza Strip are aimed solely at the Hamas terror infrastructure, armed terrorists and rocket launchers,” its statement said. A security source, speaking on condition of anonymity, said the Civil Administration – Israel’s military government for the occupied territories – had received no complaints about shootings of civilians, and no investigation was underway. Yet the family of the Palestinian television journalist Mahmoud Al Adjrami said that when Safa was struck Israeli troops were occupying their house, 90 metres across a stretch of open space from the window she was struck through. They say the invading soldiers smashed up their tile floor to get sand to fill sand-bags for firing positions in first-floor windows facing the Abu Seif house. The discarded sand, together with the smashed door and tiles, spent bullet cases and heaps of Israeli ration boxes and discarded snack wrappers, were still in the house a day after the troops withdrew. It is standard Israeli military procedure during tank raids to take over civilian homes as snipers’ nests and hideouts, holding the occupants at gunpoint. According to the testimonies of victims and from Israeli soldiers themselves, this process can frequently involve theft, vandalism and violence against unarmed civilians. The 15 women and children of the extended al Adjrami family were herded together into a single room for 19 hours, while the two adult men had their wrists tightly bound with plastic cable ties. Mahmoud’s sister Naima, 33, said the soldiers gave them water but no food. According to Mahmoud’s brother, Mamdoeh, the soldiers ransacked the wardrobes and cupboards, stealing two gold bracelets, four mobile phones and the equivalent of $8600. Next door Jabr Zidane, 52, a taxi driver, said troops had taken over his house for 24 hours, looting jewellery and four mobile phones. He shows visitors the remains of a smashed television and stereo, a broken floor, discarded sand and Hebrew-labelled army rations. In another home soldiers allegedly stole two large gold bracelets and $500 from Jumaa Abed Rabbo, 40, and his wife and eight children. “I was sitting with my hands tied with plastic ties for 24 hours. I asked if my family could use the kitchen to get water and food. They refused and so we didn’t eat for 24 hours,” Abed Rabbo said. The professed purpose of last weekend’s raid into Gaza was to kill or capture Palestinian terrorists involved in firing rockets into Israel, to capture or destroy equipment and to gather intelligence. Yet all four of the families mentioned in this article are linked to Fatah, the Palestinian faction favoured by Israel and the United States over Hamas. Abed Rabbo and al Adjrami are members of the Presidential Guard of the Palestinian President, Mahmoud Abbas – the key weapon in what the US magazine Vanity Fair said last week was a failed attempt by the Bush Administration last year to overthrow the Palestinian Authority’s elected Hamas government. According to documents and testimony unearthed by the magazine, the administration coerced Mr Abbas into reneging on a power sharing agreement that paved the way for possible Hamas-backed peace talks with Israel. Instead, new Presidential Guard factions trained by US soldiers were to be used to mount a coup against Hamas in Gaza with US-sponsored weapons shipped through Israel and Egypt. Israel’s foot soldiers seem to be unaware of this relationship. Jabr Zidane’s son Mohammed, 21, was hardly able to speak on Monday, drugged with painkillers to ease the pain from beatings and from shoulders, elbows and hands swollen from more than a day in tight plastic restraints. He said he was beaten, questioned, used as a human shield by Israeli troops, taken to Israeli territory, and released on the border. Mr Zidane said he did not know why Mohammed, an unemployed stonemason, was singled out for interrogation and abduction. This article ran Monday in the Sydney Morning Herald. Israel is using excessive force in the occupied Palestinian territory (OPT), violating human rights in the name of counter-terrorism, and its building of a “separation wall” and expansion of settlements bear the hallmarks of annexation and illegal “conquest,” according to a United Nations human rights report released today.While acknowledging Israel’s legitimate security concerns and its right to take strong action to prevent suicide bombings and other forms of terrorism, the Special Rapporteur of the Commission on Human Rights for the OPT, John Dugard, says the lawfulness of Israel’s response is to be measured in accordance with the principle of proportionality. “The Special Rapporteur finds it difficult to accept that the excessive use of force that disregards the distinction between civilians and combatants, the creation of a humanitarian crisis by restrictions on the mobility of goods and people, the killing and inhuman treatment of children, the widespread destruction of property and, now, territorial expansion can be justified as a proportionate response to the violence and threats of violence to which Israel is subjected,” Mr. Dugard writes.“On occasion, Israel’s action in the OPT is so remote from the interests of security that it assumes the character of punishment, humiliation and conquest,” he adds. “Some limit must be placed on the violation of human rights in the name of counter-terrorism. A balance must be struck between respect for human rights and the interests of security.”Mr. Dugard notes that the wall separating Israel from the West Bank “has been frenetically pursued,” does not follow the de facto boundary line, and incorporates large areas of the West Bank into Israel, with over 210,000 Palestinians threatened with being effectively cut off from their farmlands, workplaces, schools and health clinics.“The evidence strongly suggests that Israel is determined to create facts on the ground amounting to de facto annexation. Annexation of this kind, known as conquest in international law, is prohibited by the Charter of the United Nations and the Fourth Geneva Convention,” he adds, calling for it to be condemned as unlawful annexation. “While Palestinian terrorist acts are to be deplored, they must be understood as being a painful but inevitable consequence of colonialism, apartheid or occupation,” writes Dugard, whose 25-page report accuses the Israel of acts and policies consistent with all three.He cited checkpoints and roadblocks restricting Palestinian movement to house demolitions and what he terms the Judaization of Jerusalem. “As long as there is occupation, there will be terrorism,” he argues.”Acts of terror against military occupation must be seen in historical context,” Dugard says. “This is why every effort should be made to bring the occupation to a speedy end. Until this is done, peace cannot be expected, and violence will continue. “Israel’s UN ambassador in Geneva slammed Dugard’s analysis.”The common link between Al-Qaida and the Palestinian terrorists is that both intentionally target civilians with the mere purpose to kill,” Itzhak Levanon said. 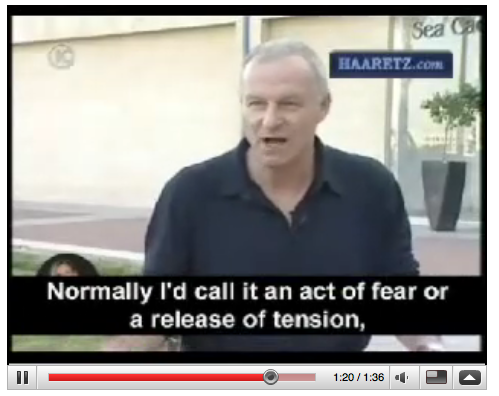 “The fact that Professor Dugard is ignoring this essential fact, demonstrates his inability to use objectivity in his assessment.””Professor Dugard will better serve the cause of peace by ceasing to enflame the hatred between Israelis and Palestinians, who have embarked on serious talks to solve this contentious situation. “Dugard was appointed in 2001 as an unpaid expert by the now-defunct UN Human Rights Commission to investigate only violations by the Israeli side, prompting Israel and the U.S. to dismiss his reports as one-sided.